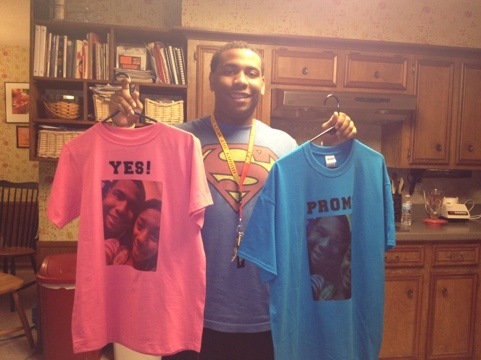 our neighbor’s son, Eddie, is asking a girl to prom tomorrow. He wanted to do something creative, so he decided to decorate two T-shirts and ask her over the announcements at school. He came with two tshirts and asked for help. I was able to find some iron on letters in my craft closet and a few sheets of printable transfers. After a lot of consultation, he came up with the final design and I spent the next two hours making the shirt. It was a lot of fun. It gave us an insight to high school life (it is scary) and the world of teenagers(utterly frightening). Not that it was too bad but I am ready to seriously consider a secluded convent in the isolated hills of South Dakota. I would just like to avoid the entire teenage years. I love the shirts! He came by my class today to show them off. He was very excited about it. I’m gonna miss having him on campus next year. I just love that boy!!! Thanks for helping him make a special memory!